In just a few hours, Kalley Krickeberg will close out the 2014 edition of the Western States Horse Expo with her workshop called â€œAdvancing Liberty, no strings attached.â€ Liberty is the free expression of the horse. It demonstrates the partnership between the horse and handler. The handler asks the horse to do different horsemanship tasks, but the horse has no tack on. No reins, no bridle, no bit. By agreeing do to the tasks, the horse is submitting its will to the will of the handler. Â Check out the video below for a brief demonstration. 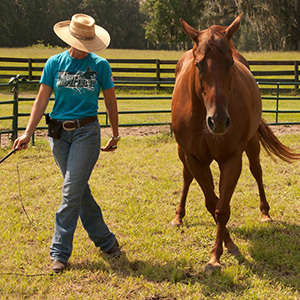 Ms. KrickebergÂ who trains out of Florida,Â has dedicated her life to finding the right combination of techniques and exercises to capture the heart, obedience and athleticism of her horses. She has taken all of her prior experiences â€“ including polo, working with the Budweiser Clydesdales, starting colts, taming wild mustangs, and giving inspirational and educational demonstrations â€“ and applied every lesson learned to her horse development. She is the inventor of the patent pending HYBRID Halter which combines the best features of a web and rope halter while eliminating the disadvantages of each, is the horse training columnist for the American Paint Horse Associationâ€™s lifestyle magazine CHROME and is a collaborator with $5 Million Dollar Rider Shawn Flarida on The Sport of Reining: Training the Young Reiner DVD which was released late in 2013. So if you have some free time this Fatherâ€™s Day Sunday Afternoon, spend it at the Western States Horse and Ranch Expo. Ms. Krickebergâ€™s â€œAdvancing Libertyâ€ will begin at 5 pm. You can find more information about her at her booth, #5201, in the A Building. There are also over 400 exhibitors, 20 plus clinicians, and horses galore. The Expo closes this evening at 6:00 pm. Itâ€™s located at Cal Expo, 1600 Exposition Blvd. in Sacramento.